Earth Starfleet Command, or Starfleet Command, was created to run and administer the newly minted Earth Starfleet in the 2113 to 2161. Earth Starfleet was created to oversee and develop all military and exploration aspects the United Earth's growing space force. Working with civilian authorities Starfleet Command worked on the ground breaking NX Project founded by the legendary Dr Zefram Cochrane and a team of engineers and scientists with him, notably Henry Archer who will be give credit for the success of the project. Earth Starfleet Command was part of several historic actions in its brief 48 year existence. It oversaw humanity's first missions into deep space exploration, first contact with dozens of species, including the Andorians and Klingons, the Xindi Crisis,the Vulcan High Command being dissolved, the Coalition of Planets and the Earth Romulan War. With the signing of the Federation Charter in 2161 Earth Starfleet Command was reorganized into the Federation Starfleet Command, still Starfleet Command for short. Starfleet Command is a division of Starfleet charged with providing leadership and direction for the organization. Starfleet Command is comprised of the most experienced members of the Admiralty, the heads of several Starfleet Divisions, and several key posts in Starfleet, they all serve vital functions to the proper operation of Starfleet. 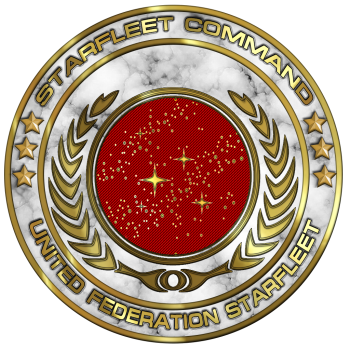 Starfleet Command Division under the direct management of the Commander in Chief of the Federation Starfleet, or Commander in Chief, Starfleet. The Division's second in command is the Commander, Starfleet and third in command the Starfleet Chief of Staff. However the Commander in Chief has vast amounts of responsibilities and is usually involved in matters of state with the President of the Federation, and the Commander, Starfleet rarely on Earth so the day to day management of the Command Division is usually overseen by the Starfleet Chief of Staff. Starfleet Command is located at Starfleet Headquarters at the former Fort Baker in San Francisco, California. It is rare that all members of Starfleet Command are there at one time due to them being needed throughout the Federation. The Commander in Chief, Starfleet is usually found at Starfleet Headquarters or in Paris meeting with the President or Federation Security Council. The Commander, Starfleet is usually deployed to Spacedock or even outside Sol System preforming inspections of the fleet. The Starfleet Chief of Staff rarely leaves Starfleet Headquarters and almost never leaves Earth itself. The UESPA or United Earth Space Probe Agency was and is in charge of exploration for first the United Earth and to this day the United Federation of Planets. There has at times been confusion where Starfleet and UESPA begin and end. For Starfleet the UESPA is a civilian agency much like the National Air and Space Administration or NASA, was for the old United States. Starfleet has authority overall military vessels (starships) under the Federation and the UESPA has oversight of the exploration vessels (spaceships). The UESPA would often send Starfleet missions of exploration for starships to undertake, much like the historic 5 year missions of James Kirk and the Enterprise. Today the UESPA still exists and oversees the exploration arm of the Federation and works hand in hand with Starfleet to meet the goals of both. Under the umbrella of Starfleet Command Branch there are several specialized offices and departments that oversee select functions of Starfleet. The Judge Advocate General or JAG as it is often called, is the department of Starfleet Command that oversees all criminal legal matters. It is overseen by the Starfleet Judge Advocate General who is also the chief legal adviser to Starfleet Command. When members of Starfleet or in some cases civilians working for Starfleet in high level positions. The Inspector General Department is overseen by the Starfleet Inspector General who oversees all investigatory functions for Starfleet to determine if there is cause for a trial or hearing and reports these findings to the appropriate authority. The Commander in Chief is a busy and demanding post, because of this they can not always be available to brief the President of the Federation or Federation Council. The Liaison post is filled by a veteran admiral who has experience i Starfleet Command, sometimes a previous Commander in Chief and at times a future one too. Their job is to represent Starfleet to the Federation Government as well as brief or advise them.